L-338 The Saga of the Two-Gun Kid! Notes: I don't know if this is the first telling of the Kid's origin, but it's the earliest one I've seen. Two Gun Kid grew up on a poor Kansas farm. His father Frank had once been the sharp-shooting sheriff of Mesquite, a wild town farther west. Frank married Milly, an eastern girl, who abhorred violence and gunplay. When the Kid was born, they moved to Kansas and took up farming. One day in the potato cellar, the young teen finds his father's old pistol. He finds that he is a natural shot, lightning fast and accurate. But his father tells him to forget about guns, that they're peaceful farming folk now. Shortly after, Sheriff Josh Meadows retires and Frank is asked to take his place. The fact it is a peaceful farming community and the pay is good convinces him to accept. But no sooner is he sworn in than the Corbett Brothers - Red, Sam, and Snake - come to town fleeing a posse. Frank is gunned down and Milly dies when thrown from the wagon by the spooked team. With his dying breath, Frank releases his young son from his promise, asking him to "bring peace to this troubled land." The young orphan picks up his father's gun plus one that Snake Corbett dropped and swears revenge. "And I'll use YOUR GUN to help anybody in trouble! THIS gun too! 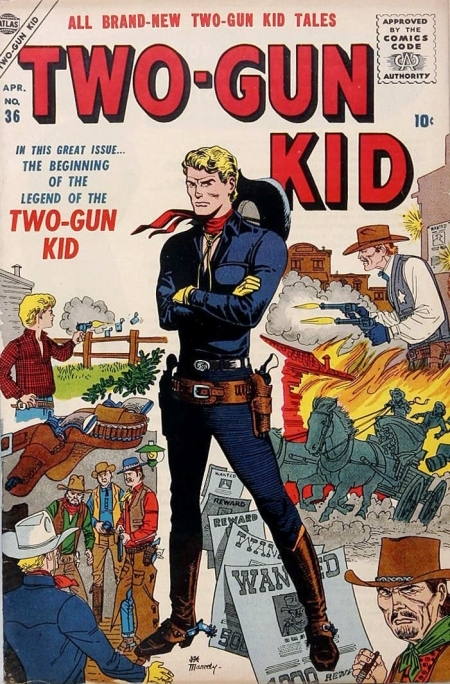 Yes, two guns ... one to always remind me of the GOOD and this other to remind me of the EVIL, the LAWLESS ..." Years later, the Kid is invited to the peaceful town of Carbonville by his friend Sam, where he has the opportunity to finally capture the Corbett Brothers. L-294 Doom in the Dust!